The Smartro projection clock is a compact and lightweight design which is packaged in a deluxe box that makes it a perfect gift choice or an ideal travel companion. Set two separate alarms for different purposes. Press the top button if you want to sleep for extra five minutes. Press any button except the top button to stop the alarm, the alarm will automatically stay on for next day. The alarm will automatically shut off if left alone for 2 minutes. The projected time and indoor /outdoor temperature are easy to see throughout the room. The projected temperature changes from indoor temperature to outdoor temperature automatically. Projected in a soft red color, it is very clear to view but will not disturb your sleeping. If you would like time projection to be constantly on, then choose the provided power adapter. Simply press the "-" button to adjust the brightness of the backlit or turn it off. Use Loop or Rainbow function to set your favorite color for the backlit. If you prefer the backlit LCD screen and time projection to be on for a few seconds, place two AAA batteries in the clock and press the top button. The clock can predict the weather, barometric pressure trend and temperature trend for the next 12 hours in advance. TIME & TEMPERATURE PROJECTION: Perfect alarm clocks for bedrooms. The projected temperature changes from indoor temperature to outdoor temperature automatically. Alarm clock projected in a soft red color on wall, it is very clear to view but will not disturb you or your kids when sleeping. The suggested distance of projection on ceiling or wall is 3.3 ~ 9.8 ft (1 ~ 3 m). Press the "-" button and hold it down for about 3 seconds the projection image will flip 180 . DUAL ALARMS WITH SNOOZE FUNCTION: Set two separate alarms for different purposes on this projection clock. With snooze function, this alarm clock allows you to get extra five minutes' sleep time. Press any button except the top button to stop the alarm, and the alarm will automatically stay on for next day. The alarm will automatically turn off if left alone for 2 minutes. LARGE NUMBER DISPLAY WITH 8-COLOR CYCLE CHANGES: Large number display on LCD & the projected time and temperature on ceiling are easy to see throughout the room. Simply pressing the - button to adjust the backlit's 4 brightness mode, light - medium - low - out. Choose your favorite color for the backlit by using Loop and Rainbow function. BATTERY BACKUP & USB CHARGING: AC powered for permanent projection and time display, battery ensures the memory of all settings during a power outage. 5V/ 1.2A USB output interface of this bedside alarm clock allows you to charge your iPhone, Android cellphones. COMPACT DESIGN: The projection alarm clocks for bedrooms can predict the weather for the next 12 hours as well as the barometric pressure trend and temperature trend; 12/24 hour, date, and week which are all displayed on the 3'' backlit LCD screen. The projection clock, a wireless sensor and AC adapter are all packaged in a deluxe box making it a perfect gift choice or an ideal travel companion. DESCRIPTION:Dr. Prepare digital projection clock is compact, lightweight and multifunctional. It a perfect gift choice and an ideal travel companion.Specifications:Perpetual Calendar Up to Year 2099.Day of week in 7 languages user selectable: English, German, Italian, French, Spanish, Netherlands and Danish.Time in optional 12/24 hour format.Dual alarms.Snooze Function: Set two separate alarms for different purposes. Press the button if you want to sleep for extra five minutes, automatically shut off if left alone for 2 mins.Multifunctional:The weather forecasting function.Colorful backlight function.USB charger function.Digital projection.Temperature: Indoor temperature measurement ranges: 14 F ~ 122 F Outdoor temperature measurement ranges: -40 F ~ 158 F Temperature alternatively in F or C.Minimum/maximum display for temperature.Wireless Remote Sensor: Wall Mount or Table Stand. One Wireless Thermo Sensor Included. 433.92 MHz RF transmitting frequency. 200 feet transmission range in an open area.Notes:1. Please read the instructions carefully before using it and learn how to change the temperature unit, how to set the time zone, how to set the daylight saving time manually, and how to set the alarms, etc.2. Please set the time zone manually before the first use and reset it after restart.3. At 1:00 a.m. / 2:00 a.m. / 3:00 a.m. the backlight and projection will automatically shut off to receive radio signals for time calibration. After the calibration, the backlight and projection will resume.4. This alarm clock supports rotating the projection. To change the direction of projection, please long press the "-" button for 3 seconds. 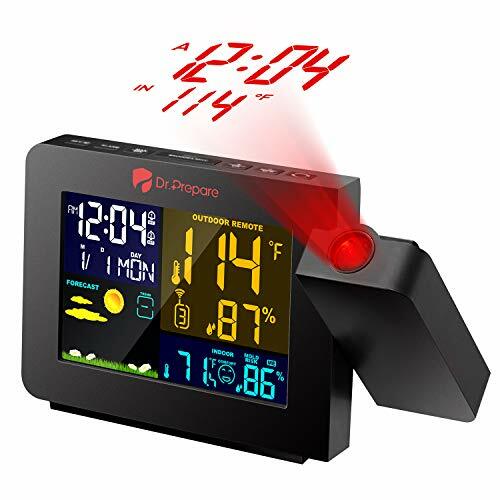 LARGE & COLORFUL LCD SCREEN Comes with a large colorful backlit LCD screen, this digital projection alarm clock displays time, outdoor/indoor temperature (min/max readings included, in C/ F), humidity, and more in clear digits. 4 levels of brightness are available for optimal vision. ADJUSTABLE PROJECTION Projects time and temperature onto ceiling or walls so you can tell time simply lying on the bed. Adjust the clock projector forwards/backwards, change brightness of projection, and reverse projection in 180 to achieve maximum clarity. DUAL ALARMS & SNOOZE Easily set 2 separate alarms and choose alarm schedule (weekdays/weekends/a full week) on your alarm clock for bedroom. Meanwhile, preset snooze time to sleep for extra 5-60 minutes. Don't worry, alarms will last 2 minutes with increased volume to wake you up. AUTO TIME SETTING Accuracy defines efficiency. The radio-controlled alarm clock automatically receives radio signal to calibrate time after rebooting or replacing new batteries. Manual time setting is available as well. BATTERY BACKUP & AC ADAPTER A DC 5V/1.5A adapter (included) is required for full functions of your atomic alarm clock while a 3.0V CR2032 battery (not included) can be used as backup power in case of power failure or outage. Note: the backlit LCD screen will not always stay lit when it is powered by batteries. Pictek introduces new 120 Projection Alarm Clocks with the introduction of the sleekest and coolest 5" Borderless Curved-Screen, FM Alarm Radio Clock, with 4 levels adjustable screen and exquisite 3 levels Adjustable Brightness Projection.PICTEK Curved-Screen Large-Readout Dual Alarm Clock Will Do More Than Just Display Time! Project the ClockProject the time on your ceiling or wall, so it will always be in full view from anywhere in the room even when you are lying in bed with 120 Angle rotary knob.The Optimal Projection Range is 2-3M, and Available Projection Range: 0.5-3M. 3 Adjust Projection BrightnessThe Curved-Screen Display with 3 adjustable Projection Brightness brightness (Off, Shimmer, Bright) meet your preference, effective protect of your eyes and does not interfere with your sleep. 4 Adjust BrightnessCurved-Screen Display with 4 adjustable brightness(Off, Dark, Shimmer, Bright) meet your preference. Dual Alarm ClocksWith the Dual Alarm Feature you can set two separate wake times if you and your spouse have different schedules.The snooze function allows 5-60 extra minutes of sleep before alerting you again. USB ChargingAlarm clock built-in USB port is convenient for you to leave a charging cable plugged directly into the clock s USB port to create a powerful nightstand USB charger for your iPhone, iPad, or MP3 player, and then, your smartphone will be fully charged every morning just like you.Battery Backup SystemConvenient DC powered for functions of radio, alarm and projection, The CR2032 Battery(included)ensures the memory of all settings during a power outage. 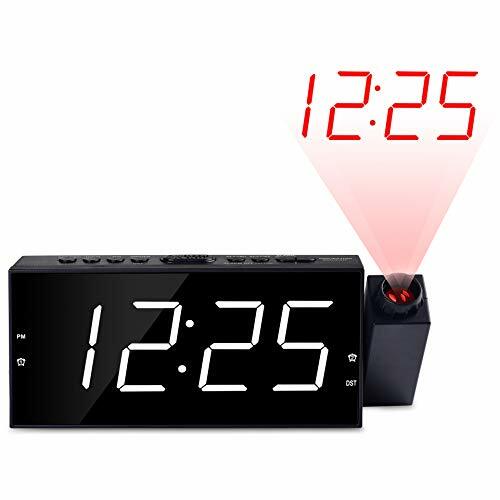 5" LED Screen & 6 Adjustable Display Brightness 5 inch LED screen display projection clock with 6 adjustable screen display brightness enables you to customize the display as your like. For sleeping well, you can adjust the light to the dimmest and read the time from the screen at night. Customized Projection Mode 4 projection brightness (OFF-Dim-Medium-Bright) can be adjusted. The 120 rotatable projector (from-30 ~90 ) can project The time onto your ceiling or wall within the range of 1.6~10ft (0.5~3M) when you are lying on the bed. The optimal Distance of projection is 7~10ft. After long press the projection button, the projection will swivel 180 . FM Radio Clock with Sleep Timer The signal reception range of this FM alarm clock is from 87.5 to 108.0MHz and the 33-inch antenna at the back of the unit can be extended for better reception. You can save up to 15 preset stations for quick access. If you like listening to FM Radio before go to sleep, you can set a sleep timer to turn the FM Radio off at the set time. Dual Alarms with Snooze Function Dual alarms can separate your waking-up time from your partner and are suitable for your timetable. Snooze function of this projection alarm clock gives you 9 Extra minutes of sleep before alerting you again. There are 4 optional alarm sounds and 3 adjustable volume levels you can select. This smart Projection Clock can wake you up comfortably. 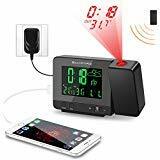 Battery Backup & USB Charging Port 5V/ 1.2A USB output interface at the back of the digital projection clock allows you to charge your iPhone, Android smartphones and tablets. 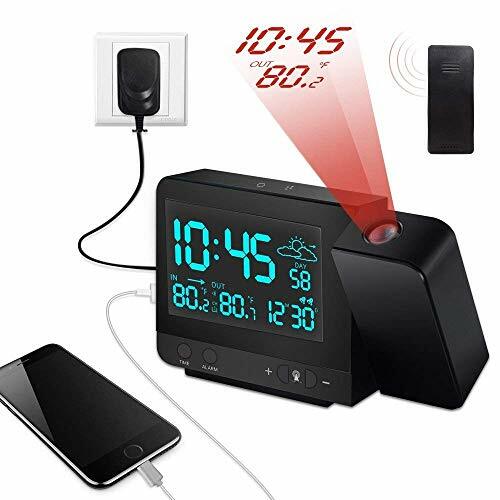 It is AC powered and must be used with Power Adapter (package included), the backup battery is built-in (Put in the clock's internals, it is invisible), which can save the settings of this projection alarm clock during power outages. Warranty: Pictek 18-month warranty and 45-day refund promise. Need a gift for Father's Day or a friend's birthday? 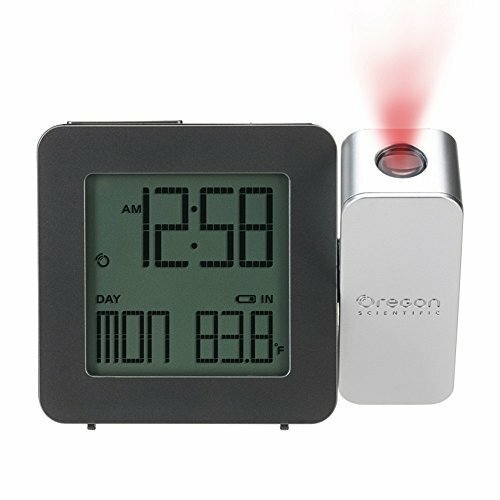 Check out the Oregon Scientific Projection Alarm Clock, a cool option that projects the time on your wall or ceiling. An adjustable projection arm allows you to adjust the angle. Set two different alarm times for different days of the week, and enjoy the convenience of atomic time you'll never have to worry about keeping up with Daylight Savings Time! This clock also tracks and displays the indoor temperature, so you'll know exactly how cold your room is before you leave your cozy blankets. 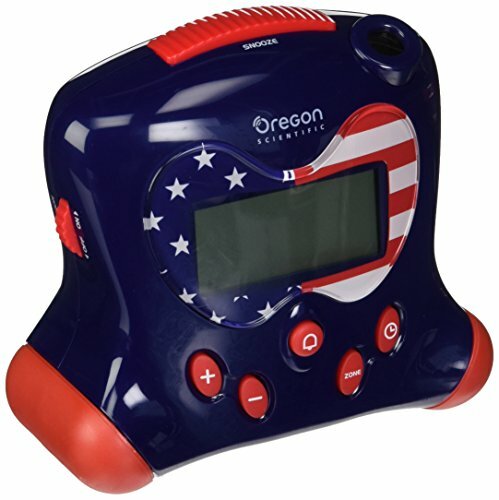 Oregon Scientific, Inc. is one of the world's leading designers and marketers of award-winning, upscale personal electronic products in the consumer electronics and toy industries. Exciting, cutting-edge technology coupled with fluid design is the hallmark of every Oregon Scientific product. The company offers five different families of products, all of which incorporate Oregon Scientific's advanced liquid-crystal display (LCD) technology for use at home, in business, while traveling, and during recreational time. Dimensions: 4.25L x 1.02W x 3.03H in.. Choose from available finishes. Hard plastic construction. Projection arm with 180 degree flip projection. Easy to read large font. Radio-controlled movement. Dimensions: 4.25L x 1.02W x 3.03H in. A little bit louder now ... that's the beauty of the Oregon Scientific Self-Setting Projection Clock. 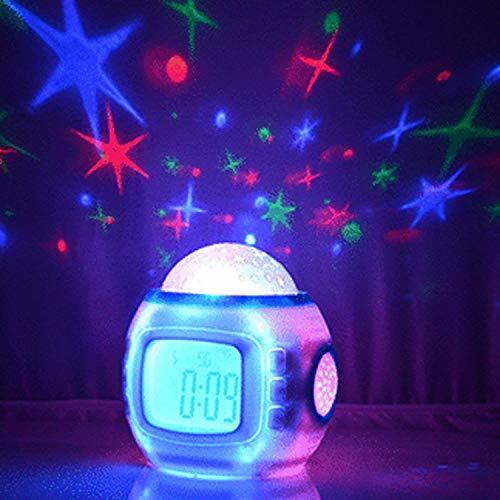 This alarm clock is available in a range of fun colors, and it projects the time on the ceiling. It also knows you hate to get out of bed, so its alarm gets louder as it goes off. It sets itself to the US atomic clock and features a large LCD display with US time zone map. Batteries and AC adapter included. About Oregon Scientific Oregon Scientific, Inc. is one of the world's leading designers and marketers of award-winning, upscale personal electronic products in the consumer electronics and toy industries. Exciting, cutting-edge technology coupled with fluid design is the hallmark of every Oregon Scientific product. The company offers five different families of products, all of which incorporate Oregon Scientific's advanced liquid-crystal display (LCD) technology for use at home, in business, while traveling, and during recreational time. 9.25H x 7.75W x 3.5D in.. Plastic construction in choice of colors. Time can be projected on the ceiling or check the LCD screen. Alarm gets louder as it goes off. Atomic movement using 2 AA batteries (included) or AC power adapter. 9.25H x 7.75W x 3.5D in. Dr. Prepare digital projection clock is compact, lightweight and multifunctional. It a perfect gift choice and an ideal travel companion. Day of week in 7 languages user selectable: English, German, Italian, French, Spanish, Netherlands and Danish. Time in optional 12/24 hour format. Snooze Function: Set two separate alarms for different purposes. Press the button if you want to sleep for extra five minutes, automatically shut off if left alone for 2 mins. Temperature alternatively in F or C.
One Wireless Thermo Sensor Included. 200 feet transmission range in an open area. 1. Please read the instructions carefully before using it and learn how to change the temperature unit, how to set the time zone, how to set the daylight saving time manually, and how to set the alarms, etc. 2. Please set the time zone manually before the first use and reset it after restart. 3. At 1:00 a.m. / 2:00 a.m. / 3:00 a.m. the backlight and projection will automatically shut off to receive radio signals for time calibration. After the calibration, the backlight and projection will resume. 4. This alarm clock supports rotating the projection. To change the direction of projection, please long press the "-" button for 3 seconds. Projection alarm features dynamic color display with brightness control and alternate calendar view. Included adapter powers this bedside clock which will charge any mobile device (charge cable, not included.) Projects current time onto wall or ceiling, with arm rotation for any angle and offers nap function. Displays the ambient room temperature and the humidity. Our Brand is "Sinweda", we have registered this brand in US Patent and Trademark Office .We never authorize other Seller to sell our "Sinweda"products. This product is ONLY Sold by "SinwedaDirect" ! Sinweda Bedroom Alarm Clock will not only give your child universal Astronomical and the capacity of good assistants hands, but also give you the couple to create a romantic surprise. This kids alarm clock designed with loud alarm, best child alarm clocks for deep sleeper. if you buy it for children under 6 years old,Please pay attention before placing an order. Light on when alarm start ringing or press any button;Press the "Sound" button,so can choose the sound,it has not off/on button,but customer can choose any button to turn it off or let it turn off automatically after 6-10seconds. 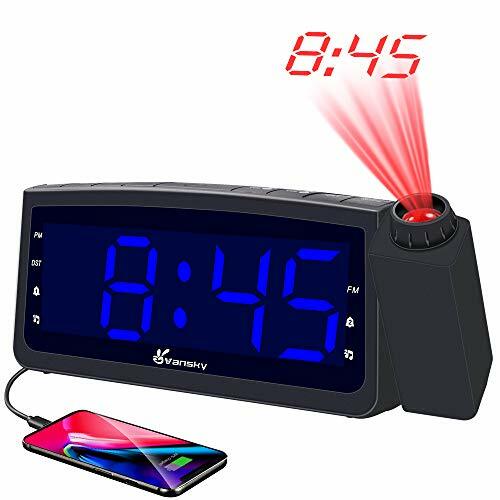 [Projection Alarm Clock] - Vansky projection digital alarm clock with 180 Adjustable Angle will Project Ultra-Clear Time onto your wall or ceiling. The optimal projecting distance is 2~3m. NOTE: The darker the better. 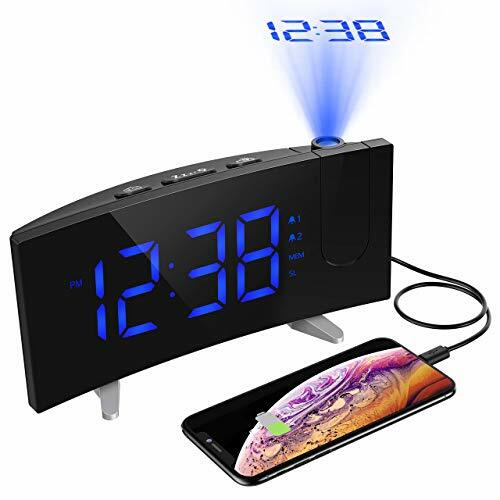 [6.57 Inch Large Blue LED Display] - The Upgraded Larger LED Display projection alarm clock for heavy sleepers make it more easier to view the time. You can switch the display brightness from High or Low according to your personal preference. [Dual Alarm Clock & Snooze Function] - The projection alarm clock makes it possible to set two separate wake-up times, you can choose to wake up with Radio Station or a Standard Buzzer. Besides, the alarm clock can afford you a few extra 9 minutes of sleep with its Snooze Function. [FM Radio Clock & Sleep Timer] - Built-in FM tuner lets you choose from a wide range of free stations (87.5MHz - 108.0MHz), you can listen to music, news, talk shows, weather forecast, traffic, sports, stories, broadcasts, etc. The Antenna at the back of the clock can be extended to strengthen radio signal. Along with the Sleep Timer Function, you can set the sleep timer and the radio will automatically turn off after the specified time. [USB Charging Port & Battery Backup] - Charge your iPhone or Android Phone with USB Port (Charge Cable Not Included). AC Power is required for all functions working (AC Adapter Included). 2AAA Battery(Not Included) needed only for memory the settings in case of power failure, not for unit working. WARRANTY - 45-day money back and 18-month warranty of projection alarm clock. The projection clock is a compact and lightweight design which is packaged in a deluxe box that makes it a perfect gift choice or an ideal travel companion. Set two separate alarms for different purposes. Press the top button if you want to sleep for extra five minutes, automatically shut off if left alone for 2mins. The projected time and indoor/outdoor temperature are easy to see throughout the room. Projected in a soft red color, it is very clear to view but will not disturb your sleeping. Long press the "-" button to rotate the ceiling display. If you would like time projection to be constantly on, then choose the provided power adapter. If you prefer the backlit LCD screen and time projection to be on for a few seconds, place 2 AAA batteries in the clock and press the top button. WWVB Radio-controlled Time Reception Equipped with an atomic clock, time is automatically set via a radio controlled signal, and in sync with the U.S. atomic clock. During the RC reception mode, only the'-' button operates while the other buttons have no function. Press and hold the '-'button for more than 2 seconds to stop the RC reception mode. The clock can predict the weather, barometric pressure trend and temperature trend for the next 12hrs in advance. Designed with a 5V 1A USB output interface, this clock can be able to charge your smartphones smoothly while you are sleeping at night. ALL IN ONE, OnLyee Projection Alarm Clock is a Multifunction loud alarm clock. ----Designed with 180-degree swivel to project time on wall or ceiling in different angles. Ensure proper projection brightness and clarity, please maintain projection distance range from 0.5 Meters to 3.5 meters. ----Large screen with 2" ultra clear LED number display, time is easy to read at a glance. ----Dual alarms to help you get up without disturb your wife/husband. 12 H & 24 H time format as your habits. ----Offering you extra 9 minutes sleep or rest. 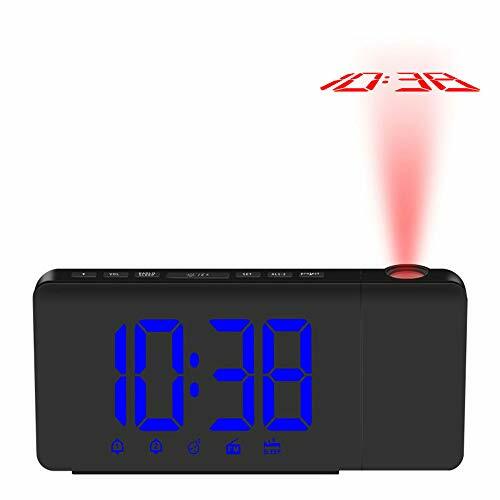 ----This alarm clock is designed perfectly with 3 dimming levels, the dimmest brightness is very comfortable without disturbing your sleep in any way. Just press "DIMMER" button to eliminate extra light in the room. ----Two AAA 1.5V batteries(not included) are required to ensure memorization of time settings so that you don't need to reset time after encountering power outage. 7" LED Display With 3 Dimmer: 7 Inch ultra-large display is easy to read especially for kids and the elder people. In case of been disturbed by the light of the clock, this alarm clock is designed with 3 dimming levels, you can operate the brightness settings according to your preference. 180 Adjustable Projection with Focus Control: Designed with 180 adjustable projector, you can easily read the time while lying in the bed as the clock projects ultra-clear time onto ceiling or wall within the optimum projection distance which is 1.6-8.2ft(0.5-2.5m). Projected in a soft red color on ceiling, it is very clear to view but will not disturb your sleep. Convenient Dual Alarm: Digital Alarm Clock with convenient dual alarms for better waking. It allows you and your spouse to wake up in a different time. Don't need to set the alarm manually once again. 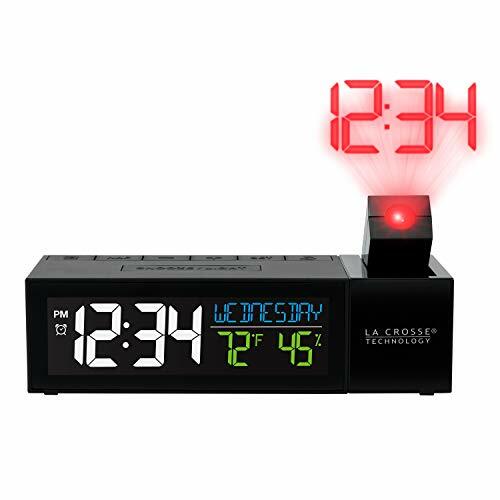 USB Charging& Battery Backup: Alarm clock gets one USB port for charging phone or Phone, Ipad or tablet. Note: The clock needs to power on. Two AAA 1.5V batteries(not included) are required to ensure memorization of time settings so that you don't need to reset time after encountering power outage. Warranty: OnLyee projection alarm clock with bed shaker gets 12 months warranty, if you have any problem, please feel free to contact us by Email: help@onlyee.com. We will try our best to make you satisfied. LED Screen: it displays time(12H/24H) or FM frequency in big fonts, with 3 levels of brightness adjustable, providing you clear view. HD Time Projection: it projects time onto ceiling or wall to make you see the time even when you're lying in bed. With 2 levels of brightness adjustable (Projection can be turned OFF). Adjustable Projection Angle: 90 rotatable projector & 360 adjustable projection content enable you to adjust the angle you prefer. Dual Alarm Clocks: built-in two alarms, and it has two types of alarm for your options: beep and radio. Snooze Function: the snooze time can be set among 5~60 minutes, you can get extra sleep time before alerting you again. Vibrate awake with the Sonic Blast Bed Shaker! An optional purchase for the Sonic Blast Alarm Clocks (Models SB700W and SB700B) Do you need a new Sonic Blast Bed Shaker? We have your bed shaker all set for you. This bed shaker will be the perfect compliment to your Sonic Blast (Model SB700W and SB700B). Your Sonic Blast Bed Shaker will be the key to waking you up. Just watch. 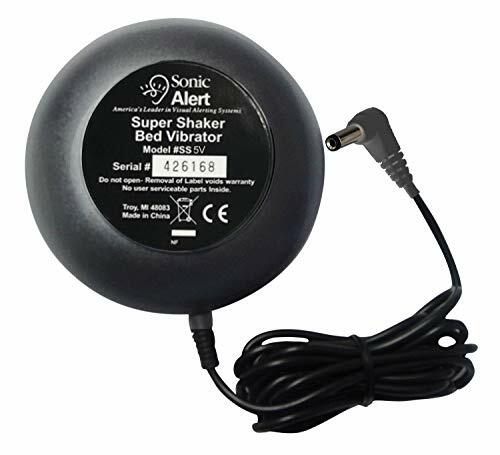 Only a Sonic Blast Bed Shaker will rock your world awake!